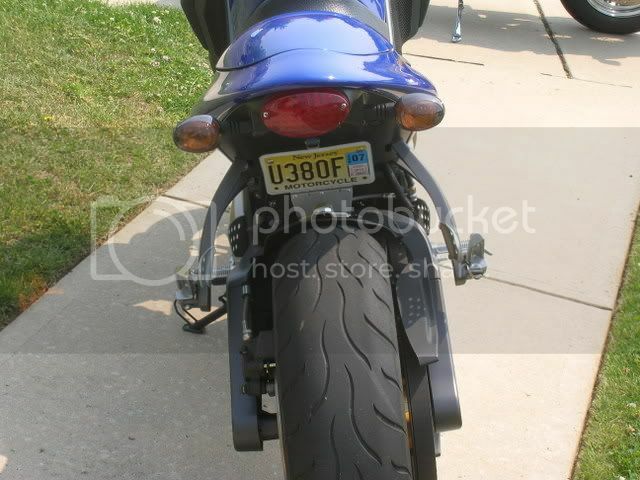 Does anyone know someone or place that has a mount system to relocate the license plate to the swing arm? Recently put a slick of carbon fiber uner the seat... Looks hot, but what to do with the plate?? Take a look at my avatar or my gallery. I put this one from Kuryakin on mine and love it. It may not be your style but it's clean and well made with LED lighting. Also comes with two size clamps for the swingarm..
two 1/4 holes and i was able to mount my X1 plate just under lamp housing on tail support.cost nothing and looks ok after rippin' off all that plastic.coupla small locator holes and my signals mounted right back original location.stock tail lamp is clear on bottom of lense so all's cool. I did the same thing drilled 2 holes under the tail light and taped it so I could bolt it to it I used 2 stainless allen head bolts. looks way better then a tag hanging off the swing arm. It is better for others to think you are a fool, than to open your mouth and remove all doubt. What does cheese say when it gets its picture taken? I chopped the plastic (not too radical) and drew up and had lazer cut a new plate holder for my Cyclone. 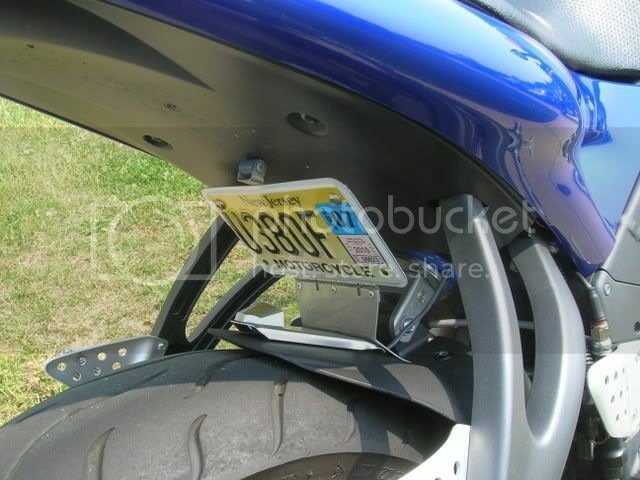 Now having seen another way of doing it (plate mounted to the hugger) I am back to pondering if it will work for my bike. Number plate lighting (or lack of) is a big points earner for plod here in OZ. Looks like I'll add a pic, when I figure out how??? ?